This rare Aloe excelsa ecotype from Mozambique is rare in gardens. 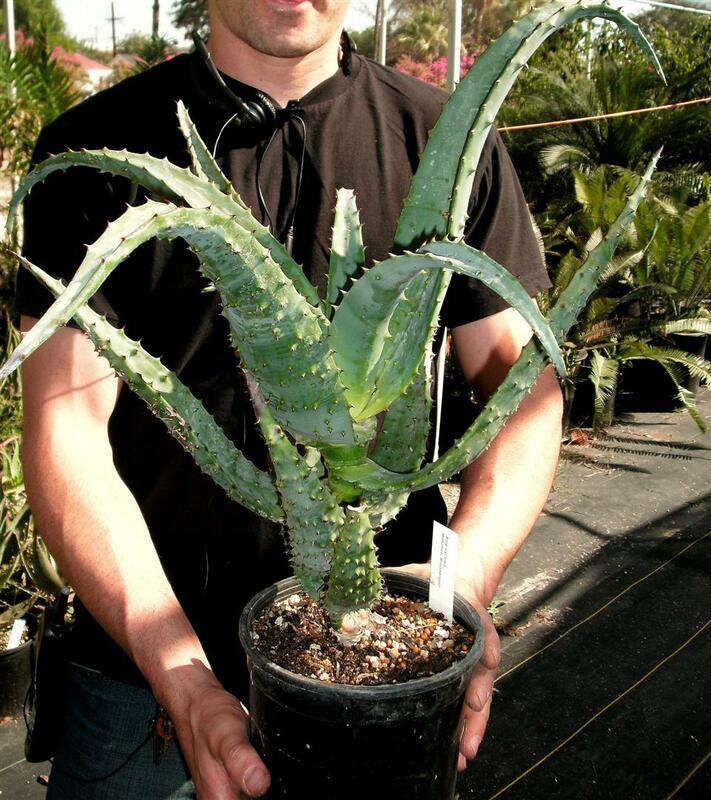 Aloe excelsa is a single stemmed tree aloe which can grow to 10-20 feet tall. It has an imposing appearance and tolerates a wide range of conditions, heat/cold, full sun and part shade. In its natural habitat, in southern and central Africa (Zimbabwe, South Africa, Mozambique, Malawi and Zambia, it grows at up to 1 mile in altitude. Aloe excelsa leaves have toothed undersides and margins. They form dense rosettes of dull blue-green leaves, compact at the top, then the leaves spread, becoming recurved up to 2-3 feet long. This results in a plant that can be 4-5 feet diameter. Leaves are dark blue-green in summer, exceeding one inch thick at the center. Aloe excelsa thrives best with ample water during its warm season, benefits from good drainage, and prefers a dry period in winter, when its impressive flowers appear. The showy flower candelabra grows to 4 1/2 feet tall, orange-red to scarlet color.